Read many reviews but the one from guru3d really is the best so far. Overall we like what we are seeing with the Ryzen 5, the per core performance most certainly is good enough for what and where it needs to be, especially in this price category. Realistically the performance overall hits a terrific, maybe even baffling, sweet-spot. Combined with 3.7 GHz and 4.0 Turbo frequencies these processors are dressed to impress. 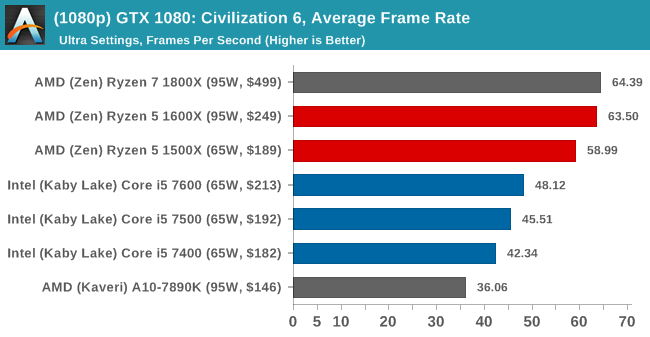 As stated, the six-core 1600X hits a sweet-spot, it costs half that of the 1800X yet feels just as fast. I did not have that same feeling with the Ryzen 5 1500X quad-core part. But honestly, the technology arena will be slowly transitioning to six or more core processors in the next 12 to 24 months. For those that are shouting four cores is enough, hey... we had the very same discussion moving from two to four cores, remember? So if you hang on to that thought for a moment, in this year of 2017 would you still purchase a dual-core processor over a four-core one? Nope, and along these lines you need to think as we need to advance in hardware, the software will then follow in this technological evolution. I also do know that a setup like this could last you years as, again, the IPC perf is really good and you have many threads available. The biggest discussion at Ryzen's launch was 1080p gaming performance. This problem is still here, but not as big as some state it is. Ryzen is a truly great processor series, but it lacks a little in 1080p gaming situations where you are more CPU bound (if you have a fast enough graphics card). There has been much debate on the cause of it, memory latency, latency in-between the CCX modules on the processor, driver issues, Windows 10, game optimizations, benchmarking with a GeForce card over an AMD one, thread schedulers and so on. The reality is simple, the results are what they are. Ryzen 5 and 7 lack a good 10-20% in performance with super fast graphics cards in a lower resolution compared to the fastest clocked Intel SKUs. Now, as this review has shown, it does depend on the game titles a lot as well. We added like eight new games and the differences with these titles look much, much better. For the game titles that do lack a bit of bite, well... you can do quite a bit with the platform to tweak out that difference.